Samsung Cuts CAPEX by a Quarter, Calls it an "End of the Chip Boom"
Samsung Electronics Wednesday slashed its capital expenditure (capex) by a quarter, which could significantly reduce its NAND flash chip output, and raise NAND flash prices back to profitability for the company, although not anytime soon. This could herald a rise in SSD prices around this time next year, although they partly contradict analyses that predict further slides in NAND flash prices through 2019, as the advent of 96-layer 3D QLC NAND flash by every major player would add to swelling inventories in the market. 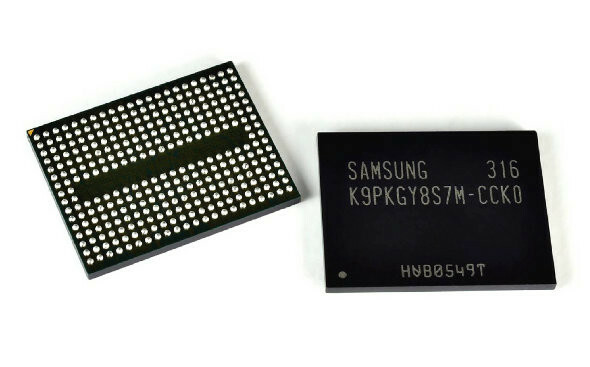 If you'll recall, Samsung reportedly desires DRAM prices to remain high and establish current high DRAM prices as a new normal. The company went as far as to further reduce its DRAM output, just so supplies of DRAM in the market remain low. The company remarked that acceleration in NAND flash price-drops signifies an end of the "boom" in NAND flash chip demand that fueled growth over the past two years, as justification to its capex cuts. 12 Comments on Samsung Cuts CAPEX by a Quarter, Calls it an "End of the Chip Boom"
Then you didn't understand what you just read. Samsung doesn't have a lack of capacity, they simply aren't going to invest more into its factories and as such artificially prevent further capacity growth, regardless of demand. This is a big FU to consumers in a round about way for being caught fixing prices, on the other hand if they did this to begin with they never would been caught fixing the horse race. Very much so and also as the articles states, Samsung wants to keep the current DRAM pricing as the "new normal" which is another big FU to consumers. We might not be at the peak of DRAM pricing, but it's still over twice the price compared to a little over two years ago. I fully understand that there's a point where these companies need to be in terms pricing, but this is pure greed. I have nothing against them making a profit, but due to just about every single large company out there gambling with their shares on the stock market, they have to appease their investors and show a huge growth every year, or their stock prices plummet. This is why we're seeing higher and higher prices every year. Just look at Intel, Nvidia, Apple and so on for some very simple examples. Yes, some of their new products are more complex and more costly to manufacture, but at some point their customers are going to say FU as well and go elsewhere, as things simply get too expensive. This is not a problem provided other manufacturers step up and fill the drop in supply from Samsung. However, because they are all in cahoots it's only a matter of time until similar announcements from SK Hynix and Micron. Micron already had their earnings report. They said they are working to mitigate impact of CPU shortages and China Tarriffs plus cut CAPEX. Toshiba and WD are doing the same. It's a wonder why they even bother pretending anymore. Not a surprise anyways... I already knew that the price fixing scandal was just the beginning that big players like Samsung would do anything to get more money, when they're already milking so much from their Galaxy phones lineup... that being said, I'm gonna get as many 970 EVO M.2 drives before the price goes up. P.S. i don't belive all company agree to cut, someone is "leak" and then Boom, capitalism.